1. Grease and flour a 9x13 inch cake pan, bake the cake according to package directions. 3. Mix pineapple and sugar then pour over cake. 4. Cook the pudding according to the package directions and pour over cake. Chill in refrigerator. 5. 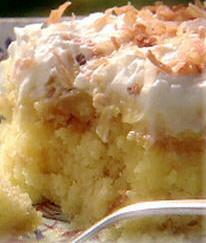 Spread whipped topping over cake and sprinkle coconut on top.